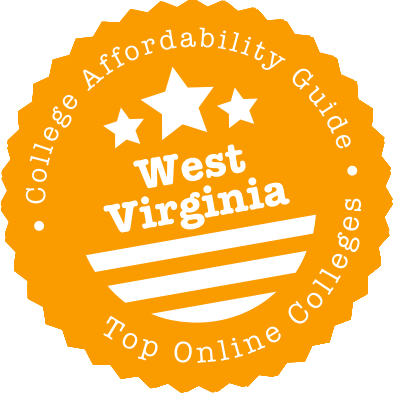 Scroll down to see the top not-for-profit colleges and universities in West Virginia offering online degree programs. For students seeking degrees that can be completed online, West Virginia University offers three undergraduate options and fourteen graduate options: a Bachelor in Multidisciplinary Studies, a Nursing R.N. to B.S.N., a Regents Bachelor of Arts, an M.S. in Business Data Analytics, an M.S. in Clinical Rehabilitation and Mental Health Counseling, an M.A. in Communication Studies: Corporate and Organizational, an M.A. in Higher Education Administration, an M.A. in Instructional Design and Technology, an M.S. in Integrated Marketing Communications, an M.L.S. in Legal Studies, an M.A. in Literacy Education, an M.A. in Music Industry, a Master in Public Health, an M.S. in School Health Education, an M.S. in Software Engineering, an M.A. in Special Education, and an Ed.D. in Special Education. Online students are able to complete coursework whenever it is convenient, which makes an online degree ideal for those with busy schedules. Financial aid is available for students who qualify for grants, loans, and scholarships. Marshall University offers four undergraduate degrees and six graduate degrees entirely online: a Bachelor of Science in Medical Laboratory Science, a Bachelor of Science in Medical Laboratory Science, a Regents Bachelor of Arts (Completion Degree), a Registered Nurse to Bachelor of Science in Nursing, a Master of Science in Adult and Technical Education, a Master of Arts in Counseling, a Master of Arts in Leadership Studies, a Master of Arts in Elementary or Secondary Education (with an emphasis on General Education, Early Childhood Education, English as a Second Language, Math through Algebra I, or Middle Childhood Education), a Master of Arts in New Media Studies, and a Master of Science in Nursing. They also offer many undergraduate minors and many graduate certificates online. Marshall University offers a student guide for online students, and online students can also take advantage of many of the resources that on-campus students use. Online students participate in courses by utilizing forums, chats, and e-mails, and while there are deadlines and exam dates, students are able to complete coursework whenever it is convenient. Classes begin in January, May, June, July, and August. Students who are interested in an online program in psychology can choose to pursue either a Bachelor of Arts (BA) or Bachelor of Science (BS) degree from the University of Charleston. Additional BS degrees are also available online in accounting, business administration, nursing, and organizational leadership. The BS in Organizational Leadership degree is a completion program designed for working adults. Applicants must have completed the equivalent of 40 semester credit hours from an accredited program or institution to be considered for admission. Students who meet this requirement can take as few as 18 months to complete an additional 48 semester hours towards the degree. Courses for the degree are delivered both online and on campus. On the graduate level, the university offers a Master of Science (MS) in Strategic Leadership degree that follows a hybrid system of delivery. The program is comprised of 36 credit hours, follows a cohort model of education, and can be completed in 18 months. A Master of Forensic Accounting program is also offered online. At the current time, the university has one online doctorate degree, which is the Doctorate of Executive Leadership. The program requires students to attend a one-week residency in Charleston every year. Wheeling Jesuit University offers a Master in Education Leadership degree that is designed for working educators. The program is comprised of 33 credits, offered entirely online, and can be completed in just one year. Students accepted to the program can choose to pursue the school and system leadership track or the instructional leadership track. Students who choose the school and system leadership track can also earn their principal, superintendent, or supervisor of instruction certification. The instructional leadership track is designed for teachers looking for ways to advance their leadership skills inside and/or outside the classroom. Wheeling University also offers a Master of Science in Nursing (MSN) degree with tracks in the following areas: family nurse practitioner, nursing administration, and nursing education specialist. All courses are available online and students can complete the clinical and practicum requirements of the program in institutions within their home communities. An accelerated RN to BSN/MSN program is also offered online. The Accelerated Certification for Teaching (ACT) program is an online opportunity for educators who want to earn a teacher certification for grades 5 to adult. This program also gives licensed teachers a multi-categorical special education endorsement with an additional 12 to 19 hours of coursework. Fairmont State University offers six online master's degree programs, with all but one of the programs offered by the School of Education. These six degrees can only be obtained through online coursework. The non-education program is a Master of Science in Criminal Justice, a 30-credit program that offers both a thesis track and a capstone track. Students may enter the program in the fall, spring, or summer semester. Four concentrations are offered online for the Master of Education degree. The options are multi-categorical special education for licensed educators, multi-categorical special education for non-education majors, professional studies (which is open to licensed teachers and students without licensure), and digital media, new literacies and learning (teaching license not required). The final online program is a Master of Arts in Teaching, which provides an accelerated path for students who did not major in education as an undergraduate to receive teacher licensure. The program includes the required clinical experiences needed for teaching in specific content areas. The program does not currently offer licensure in elementary education. West Virginia’s colleges offer some truly great distance education opportunities. The only problem is that they can be hard to find because the state doesn’t present them clearly. This page does. We’ll show you the best place to find degrees and courses, inform you about an online degree program for returning students, and point you toward accelerated classes that can help you graduate early. Then, we’ll unveil our list of high-quality affordable schools before taking a tour of some schools with questionable accreditation status. West Virginia Virtual Learning Network (WVVLN) is supposed to be the starting point for a search of the public online degrees in the state. In reality, the website is a collection of empty pages. Since it’s not tremendously helpful in its current iteration, you might be tempted to look elsewhere. But state websites such as the Community and Technical College System of West Virginia direct you to, you guessed it, WVVLN. And WVICU, the association representing West Virginia Independent Colleges and Universities, doesn’t have a program search function. That means you can either search individual schools for degrees and courses or search the Southern Regional Education Board (SREB) Electronic Campus. The latter lists all degree programs its member schools offer, and you can filter your search by state. Here’s the downside: Only Marshall University and West Virginia University participate. Speaking of SREB, while Marshall and West Virginia University are the state’s entrants into the organization’s Academic Common Market, West Virginia residents can study a dozen other disciplines remotely from out-of-state schools that take part in SREB programs. The benefits? First, it gives you access to programs that are unavailable in West Virginia. Second, it lets you enroll using the institution’s in-state tuition rate. First, you don’t need to major in anything. Second, you’ll be given credit for prior learning — whether gained through work experience, military credit or certifications — before enrolling. You can also earn credit by passing a CLEP or DSST exam. Last, you need to have taken at least 24 credits as a resident at a state college, and you may have to take up to 12 credits on the campus of the college awarding the degree. Everything else can be taken online. West Virginia’s community and technical colleges offer a similar program, called the Board of Governors Associate in Applied Science (BOG AAS). Adult learners are eligible for a BOG AAS two years after graduating from high school. While all of the state’s public institutions have RBAs or BOGs, some also offer certain RBA and BOG courses via the West Virginia Remote Online Collaborative Knowledge System (WVROCKS). One advantage of WVROCKS courses is that they’re only eight weeks long, shortening the time it takes to get a degree. Another advantage is per credit tuition prices are often substantially less than other online courses. In 2018, U.S. News & World Report ranked West Virginia University, Wheeling Jesuit University and Concord University’s online graduate education programs within the top 200 nationally. Although you can find prestigious programs elsewhere, West Virginia teachers and administrators are guaranteed to have ample choice in terms of degree and certificate options, as well as opportunities for online training and professional development. The Erma Byrd Higher Education Center pools the resources of three public universities — Bluefield State College, Concord University and Marshall University — into one collaborative space in Beaver, WV. Students can take coursework from any of those three schools; and the Erma Byrd Center also has distance learning classrooms. This setup allows students in the rural southern part of West Virginia to earn an online degree while still access resources familiar to college campuses, such as a library and allied health laboratories. West Virginia consistently ranks as one of the most affordable states in which to earn a public higher education. Its schools’ online programs are no different. Below is the one public university that fulfilled our rigorous criteria for both quality and low costs. You can learn more about the school (e.g. graduation rates, debt loads, etc.) on College Scorecard. West Virginia University is the only public university in the state to merit strong online rankings from U.S. News & World Report — the ranking for Online Graduate Computer IT Programs was particularly stellar! If you want to explore the program offerings, head to the WVU Online and Extended Campus. As with other public colleges, adult students can target an RBA. Similar to Marshall University, the university runs an early college program for high schoolers called ACCESS WVU. It costs $75 per credit, and coursework is eligible for federal financial aid if you file the FAFSA. WVU also reaches out to educators through its online Teacher Center. The college makes it easy to do things like take or renew your substitute teacher training or pursue professional development courses. Many programs are sponsored by school systems, meaning that participants may qualify for government training funds. There are plenty of reputable sources for an online degree in West Virginia, most of which come from brick-and-mortar colleges, so you shouldn’t need to go looking for programs from schools you’ve never heard of. Still, it’s always a good idea to verify a school’s accreditation status and make sure it’s not facing legal action from the government. The Higher Learning Commission (HLC) accredits West Virginia’s public universities, its nine public community and technical colleges and most of its private colleges. To ascertain each school’s accreditation status, search the HLC’s Directory of Institutions for West Virginia. Click on your school to see its accreditation standing, and make sure to read any Public Disclosure Notices. Negative actions include a school being placed on notice or, worse, on probation. Most for-profit schools seek national accreditation. To check a school’s status, visit the Council for Higher Education Accreditation (CHEA) Database. Don’t see your school there? That means it’s not accredited. American National University is a private, for-profit school group with two campuses in West Virginia — Parkersburg and Princeton — as well as distance education via ANU eUniversity. All of the school’s campuses are accredited by ACICS, a national agency whose status the U.S. Department of Education (DOE) has moved to revoke. American National University and all other schools under ACICS remain accredited while ACICS appeals the decision to the DOE, but such institutions are likely in the process of changing accreditors. However, they cannot publicly disclose this until they receive full accreditation. Future Generations Graduate School is a quirky outfit with regional accreditation from the Higher Learning Commission, which placed the school “on notice” in June 2015. From that date, the school has a little over one year to assuage HLC “concerns related to rigor, faculty governance, program review, assessment of student learning, and governance and administrative structures.” If it fails to makes steps in the right direction, the HLC Board may take further action at its June 2017 meeting, such as placing the school on probation. During this time, it remains fully accredited. Mountain State College is an ACICS-accredited school with two online programs — Dependency Disorders Technology and Medical Assistant. Like ANU, it remains in good standing with ACICS. The problem is that ACICS is not in good standing with the Department of Education. Mountain State College may be trying to switch accreditors before ACICS’s DOE recognition is revoked. Valley College is a proprietary school in West Virginia with three locations — Beckley, Martinsburg and Princeton — and an online arm. Like ANU and Mountain State College, it is accredited by ACICS, whose recognition by the DOE is in the process of being revoked. West Virginia Junior College is another proprietary school with three physical campuses — Bridgeport, Charleston and Morgantown — and an online campus. ACICS accredits all of them. Higher Learning Commission: The HLC is is the regional accrediting body for degree-granting colleges in West Virginia. College Foundation of West Virginia (CFWV): CFWV has general information on funding opportunities and programs that prospective distance education enrollees may be interested in, including the Higher Education Adult Part-Time Student Grant Program, the Regents Bachelor of Arts and the Board of Governors AAS. Community and Technical College System of West Virginia (CTCS): In addition to being the voice of two-year colleges in the state, CTCS runs workforce development programs with online components and hosts online training opportunities. West Virginia Higher Education Policy Commission: Though there’s not much in the way of distance learning resources on the WVHEPC website, it does outline transfer and articulation agreements between the state’s four-year public schools and delves into RBA program guidelines, both of which are pertinent to the state’s online learners. Southern Regional Education Board (SREB) Electronic Campus: West Virginia is a SREB member, and students can search for online degree programs or courses at colleges and universities throughout the South. The website covers credit transfer info, lays out financial aid resources, and lists programs that are eligible for resident tuition. West Virginia Remote Online Collaborative Knowledge System (WVROCKS): Use WVROCKS to search for online courses that count toward an RBA degree or Board of Governors Degree. Criminal Justice students can also use the platform.